Thanks to its robust design and high corrosive resistance, the CA aluminium enclosure range delivers high mechanical strength and are particularly suitable for potentially explosive atmospheres. 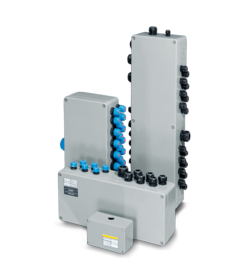 They can also be used as terminal boxes or control enclosures for connection of electrical components. All built-in components must conform to the relevant approvals. 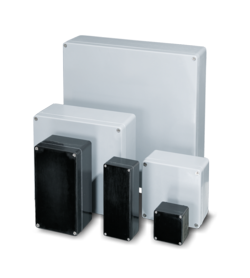 Only materials that correspond to the temperature range T6 required for Ex enclosures are used in these enclosures and components. The minimum type of protection rating of all enclosures and screw connections is IP 64. The enclosures come with captive cover screws, optional factory fitted external hinges are also available. Either an EPDM or silicone seal can be used. BERNSTEIN CA aluminium enclosures are finished RAL 7001 as standard. Thanks to its robust design and high corrosion resistance, the CPG Grey glass-fibre reinforced polyester enclosure range delivers high mechanical protection and are particularly suitable for potentially explosive atmospheres. They can also be used as terminal boxes or control enclosures for connection of electrical components. All built-in components must conform to the relevant approvals. Only materials that correspond to the temperature range T6 required for Ex enclosures are used in these enclosures and components. The minimum type of protection rating of all enclosures and screw connections is IP 64. The enclosures come with captive cover screws, optional factory fitted external hinges are also available. Either an EPDM or silicone seal can be used. Bernstein CPG polyester enclosures have a grey RAL 7000 self colour finish as standard.